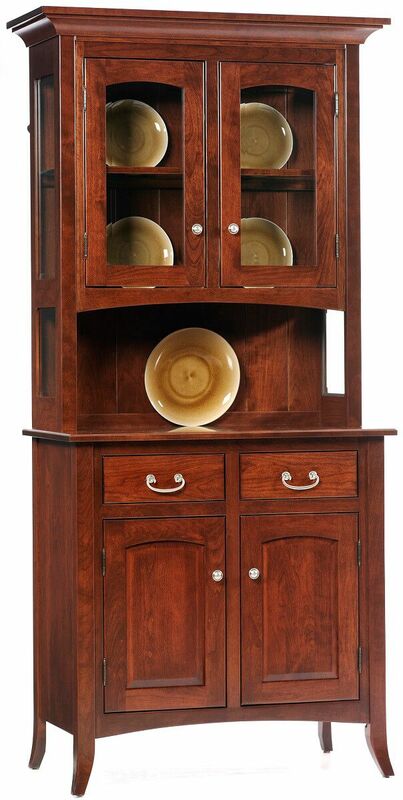 Our South Hooksett Small China Cabinet with open deck is handmade by our Amish artisans from the responsibly harvested domestic hardwood of your choice. Combining classic style and craftsmanship with modern conveniences, our South Hooksett Small China Cabinet is the perfect choice for your eat-in kitchen or dining room. Place your china or other display items on the glass shelves with recessed touch lighting. An open deck is complemented by a shiplap backing, and the buffet adds drawer and cabinet storage. To get the pictured look, order your South Hooksett Small China Cabinet in domestic Cherry with our Christmas Cloves wood finish. Shaker style lends itself to a variety of settings. As shown, it is quite formal, but a painted version could lend a more casual feel. Use our Create Your Piece options menu to begin.